SFV Roller Derby would be nothing without our hardworking officials, both our onskates Referees and our dedicated Non-Skating Officials. Throughout the year, the Training Team would like to honor an official in recognition of their contribution to the league. 1. How did you decide on your derby name? What does it mean to you? 2. How did you get started as a roller derby official? How long have you been involved? I had some friends in the league encourage me to help at a few games early on and it just went from there. Times I have been injured or not as active skating it has been a great way to stay involved and see everyone. I think I have been NSOing for around 5 years. 3. What's your favorite roller derby memory? Oh man, so many great memories! Hard to choose just one. Any time I am laughing with the awesome SFV gang is a great memory! 4. Who inspires you, both on and off the track? It's gotta be my derby wife, Dovahkill. She is just the best all around! She always works hard and is there to help everyone at any time. 5. What's your spirit animal? Why? My parents always say sloths are! Haha, sounds about right! They are definitely one of the animals I hold most dear to my heart. 6. What's something you wish all skaters knew or realized? To not take everything so seriously. We are all here to have fun! 7. When you're not on the track, where can we find you? Doing something animal related, whether it be hanging with my dogs, watching nature documentaries, working with exotic animals or visiting animal facilities. I really wanted to choose something that was kind of silly and cute that also reflected my love of all things '80s. The "hi-ho" part refers to when the gremlins all go to see Snow White and the Seven Dwarfs and tear up the place like the party animals that they are. What's your favorite derby position? Blocker! I love all the team work involved. Who inspires you on the track? The lovely ladies of SFV Roller Derby, of course! Everyone's loving, supportive and badass ways inspire me in all aspects of life. Dovah in particular is someone who inspires me with all of her hardwork and dedication. She holds a special place in my heart as my main squeeze! What is your favorite derby memory? I had such a blast at the last freshie bout -- Lion Maidens versus the Judas Beasts! Getting to know everyone better and having so much love from my friends and family at the game was amazing. It's either gotta be a doggie because they are my favorite animals ever or a doe because I have a deep desire to match my love, Severus Snape. How did you get involved in roller derby? I have been interested in roller derby for some time now. I started a new job which gave me more free time. I wanted to use my free time for roller derby. <3 I had done intense sports in the past: Crossfit, Boxing/MMA/Muay Thai, etc. What position do you like playing? Women/girls inspire me. Mothers, daughters, sisters, cousins, nieces and grandmothers! By playing roller derby, I am taking part in creating a community of strong women, a support system of positive role models from different walks of life. My league has become my family; my roller derby family in my giant roller derby community. It’s worldwide! What are your derby goals? My goals for derby are to pass the WFTDA assessment and continue showing up for practice. There will be good practices and bad practices; the point is to continue showing up. I started my derby adventure last year in December. It has been so amazing learning to play this epic sport and to meet all these wonderful people. There is so much more to roller derby than I realized. Like picking a derby name. I didn’t think it would be so difficult, but it’s so important because it becomes who you are. I had a list of names but I narrowed it down to Dovahkill! It is a reference to a video game called Skyrim. Dovahkiin means Dragonborn and dragons are awesome! 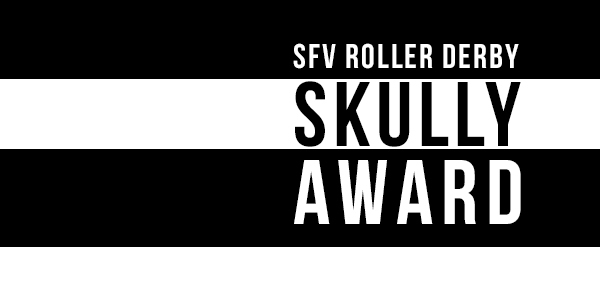 I’m so happy that I have SFV Roller Derby! I have met so many different, interesting, talented, and hilarious people here. They make me a better person! It’s so wonderful having such a huge family instantly! I can’t wait to get on the track and hip check another derby family with them!